Bob Dylan's iconic song still sounds great. "The times they are a changing". This is a rather poor excuse for a lead in to a blog, as I just wanted to play it again. The first part of this blog could be described as payback, while the second part presents me with a moral dilemma. The first may be seen as petty, while the second as pretty awful. You see, for years I went to extraordinary lengths to avoid street canvassers and charity co-opters. You know the street canvassers I mean. People with clip boards asking you for a few minutes of your time. They want your views on shopping habits, television viewing or a plethora of additional subjects. The charity street collectors have become known as "Charity muggers", or "Chuggers" - a title that most charities are not fond of. These are mostly young people earning around £6 or £7 an hour who stand on the streets of towns and cities up and down the land trying to separate you from your money. The causes change, and depend on what tee-shirt they're wearing that day. They don't work for the charity that they're collecting for, but for a "face to face fundraising company" who are commissioned by the said charity. They are almost always bright, cheerful, and for some, persistent. Over the years I have avoided them like the plague. But the times they are a changing. It's payback time. Now, no one seems to want anything to do with me. The street canvassers ignore me, and the Chuggers don't give me a second glance. I've become so pathetic that I now head straight for all of these canvassers and collectors, giving them every opportunity to engage with me. But nothing. I am no longer part of someone's demographic target. You'd think that after years of giving them all the cold shoulder that I'd be pleased, but strangely I'm not. There's just no pleasing some people is there? It seems that I've been discarded; no longer relevant, and no longer wanted. Ah well, maybe AgeUK will be represented on the streets soon - surely I'll have a chance there? From one type of charity fundraising to another. And this is where I have a moral dilemma. I have worked in charities most of my life, and I know what it's like to have to raise money. But where should the line be drawn below which you shouldn't go? Let me take as an example child poverty in Africa. There is no doubting that the situation, particularly in Sub-Saharan Africa is horrendous. The facts are staggering; the need is evident, and the statistics of which can be found on many web sites. And it's here that my moral dilemma begins, and is in two parts. How do you present that need, and what is being done to meet that need? I usually have my tea about 6 o'clock and sit down to watch a bit of television. I've become increasingly concerned over the last few weeks at some of the TV advertising. It was particularly apparent last night. I was watching a channel which is dependent on advertising. In an hours programme there was four advertising breaks. Each one featured the charities Children in Need or Water Aid, and this at a time when families would be sitting down together (at least those families that still operate as a family). The adverts had images such as the one above, basically of dying children. The images, voice over and choice of music were all designed to illicit an emotional response from the viewers, and with the timing of the adverts, I can only assume that the target was the whole family, children included. I've done advertising courses, and understand some of the philosophies involved. The images are undoubtedly designed to shock, and to make us pick up the phone there and then and commit to giving £2 to £3 per month. If shock tactics are required for people to respond to need, then it is an indictment on our society. I've worked in charities where disturbing images of human beings could easily have been used, but I've refused to go down that route. I've preferred another way of visualizing need, and how that need is met, and it's not one of shock. Children in Need or Water Aid may well be hugely successful through their advertising, but I find them offensive - a word that I use very reluctantly. This is the first part of my moral dilemma. The second part asks what is being done to address the need? There is poverty across the world, but there is often a focus on the plight of those living in Sub-Saharan Africa. 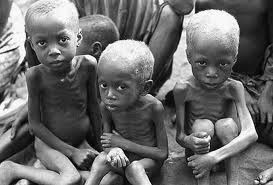 For as long as I can remember there has been famine in Africa, and every year there are appeals to address that need. My reader may well remember the 13th July 1985 when money was raised particularly for the famine in Ethiopia. This was the dual-venue concert held at Wembley Stadium and in Philadelphia, and called 'Live Aid'. It raised about £150 million, and was said at the time to have "changed the perception of Africa". This was now over 26 years ago. 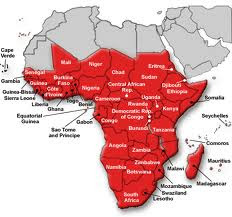 The current British Government has committed £203 million a year until 2015 to parts of Africa, and who knows how much is being provided through national and international not-for-profit organisations. No matter how much is given, the need doesn't seem to diminish, and more is required. On its Facebook page, the Department for International Development says, "We're helping people to lift themselves out of poverty, for good". Their relatively short-term plans for some of the most deprived areas of the world are to be applauded. They are working in partnership with the Kenyan Government to improve the long-term prospects of farmers and local communities which I've no doubt will bring an improvement. The building of wells by the likes of Water Aid is no doubt an excellent step forward, and for relatively small amounts of money, hundreds of lives are saved. Save the Children's child sponsorship scheme will also improve the lot of the 5,000 or so involved at any time. But what of the future? Despite billions of pounds and dollars being poured into Africa over the last few decades, we are still being inundated, every year with appeals for yet more money. Kenya is working with others, but what of their neighbours? What of those countries still riddled with violence, or those with allegations of corrupt Government against them, or those who may be just simply incompetent? If individual countries don't change, why should the situation in those countries change? We save a few lives; improve the lot of others, only to find that they are quickly replaced by more people in need. Here's where I have a dilemma. I don't want my money to go to countries dominated by violence and corruption; they should be sorted out before they should expect international aid. But, the plight of those living now in poverty and deprivation is so horrendous, that they cannot be ignored. I cannot punish the poor, the hungry and the dying because of the actions of those who rule over them. So until something is done about "regime change" in some areas, I guess we're going to have to put up with daily requests to dip into our pockets and purses to meet the needs of the world's poor. It may be right that in many ways, "The times they are a changing", but in respect to world poverty, they are not changing at all, or at least not quickly enough.